"With a bolt of lightning on my kicks . . .The court is SIZZLING. My sweat is DRIZZLING. Stop all that quivering. Cuz tonight I’m delivering," announces dread-locked, 12-year old Josh Bell. He and his twin brother Jordan are awesome on the court. But Josh has more than basketball in his blood, he's got mad beats, too, that tell his family's story in verse, in this fast and furious middle grade novel of family and brotherhood from Kwame Alexander (He Said, She Said 2013). Josh and Jordan must come to grips with growing up on and off the court to realize breaking the rules comes at a terrible price, as their story's heart-stopping climax proves a game-changer for the entire family. A very deserving Newberry winner. 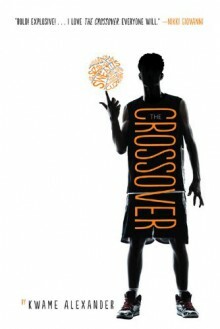 I loved the poetry, the characters and the story about basketball and family. Its very heartfelt. One I will recommend. this book is a quick read and perfect for kids who don't like to read. It's all written in verse, so there's not very many words on a page. good creativity, though not a whole lot of connection with the characters. Then again, I'm definitely not the target age group. 2015 Newbery Award Winner. With the constraints of being a book in verse, The Crossover felt more like a short story or a novella rather than a novel. Some of the poems were clever, and there were some appealing moments, but I was underwhelmed by the overall production.